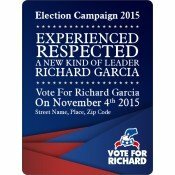 Custom campaign and election magnets are dynamic and they easily become an asset to a campaign. 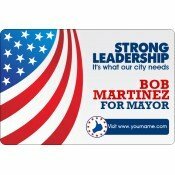 These promotional campaign magnets work great for campaigners who are working in all budget sizes. We offer a value effective selection of election magnets for refrigerator and car advertising. Additionally, campaigners can save on art setup, online design proof and shipping because they are offered free on all our customized magnets. 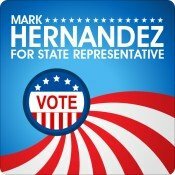 Personalized campaign and election magnets make perfect replacement for many traditional campaign promotion items used over the years. These promotional magnets are built to offer maximum benefits to campaigners with a low budget. Billboards, news hour debates, flyers, lapel pins, pens, customized stationery and magazine advertisements are popular during the election. People hate the intrusion into their lives and often end up casting a vote out of boredom. 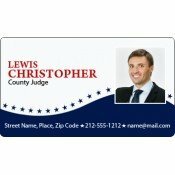 This selection features campaign business card magnets, election car magnets, political campaign magnets, political campaign car magnets and campaign magnetic car signs. Campaigners can select these promotional campaign refrigerator and car magnets based on their requirements and budget. They can order these customized election magnets as an individual gift or for mass advertising over the cars. We offer free full-color printing, thereby allowing candidates to produce their campaign information in a brilliant way. This means they don’t have to think twice about using colors on their promotional canvas. We encourage them to print their election symbols in their true colors with contact details, photos and other information. 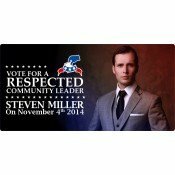 Many candidates find these promotional magnets affordable and they can save by ordering wholesale. All our custom election magnets are excellent choice for stacking and stocking for long-term gifts. Ideal gifts for tradeshows, election rallies and other mass events! Campaigners can gain huge discounts on bulk orders on these customized magnets. Save on shipping, art set up and online design proof because their prices are inclusive! All these promotional election and campaign magnets are crafted on best-selling custom magnets but that doesn't mean campaigners cannot try other magnets. We encourage all our clients to go creative and work with different custom shaped magnets, circle magnets, oval magnets, state shaped magnets, etc. To know more about printing, pricing and other details of these promotional campaign and election magnets, feel free to contact us at 855-762-4638 (Toll Free) or write to us at info@CMagnets.com.